Cinematic Guitars 2, Other virtual guitar from Sample Logic. Sample Logic has announced Cinematic Guitars 2, a new collection of some 1200 instruments and multis for Kontakt Player and Kontakt. The designers at Sample Logic say that guitars were chained up, drilled, shattered, sledge hammered, and set on fire for this collection. CG2 hosts a collection of interface controls providing 40 sections of onscreen effects and parameters. 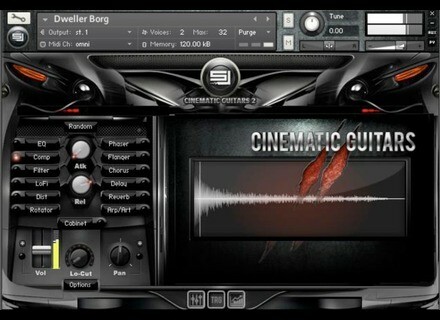 The main foundation of the interface is built upon Sample Logic's "multi-core effect sequencer", first introduced in the original Cinematic Guitars. Now, in CG2, this interface has been expanded with the ability to control effects by assigning tempo-synced step sequencers and LFOs to any instrument parameter and the option to sequence the bypass feature of each effect in realtime. In addition, all loop-based instruments can be controlled, effected, and manipulated at the transient slice level directly from the waveform view. CG2 also employs the new 4-band SSL EQ with multi-core sequencer functionality. Cinematic Guitars 2 is divided into 3 main categories: Atmospheres, Instrumentals and Percussives. Each contains a variety of sounds such as: explosive impacts, industrial kits, tempo-synced melodic & rhythmic loops, arpeggiated instruments, atmospheres, leads, pads, synths, transitions, stingers, and a collection of traditional guitar instruments. CG2 introduces a new feature called "Trigger FX". TFX provide 48 effect chains that can be triggered from any one or combination of six on-screen key pads and by key-switches on the keyboard map. TFX can also be triggered via the "Arppegigater" and can also be used with loop-based instruments on a transient slice basis. One of the features introduced in CG2 is the "Multi Script Macros" feature. Every Multi in CG2 contains up to 6 Macro knobs that can be assigned to control any combination of interface parameters. Multi script macros are customizable and can be created and saved as custom multi macros. By design, any combination of instrument interface parameters can be assigned to a single macro. Atmospheric/Ambient Soundscapes and Stinger Construction Kits. Morphed Guitars, Synths, and Pads. Melodic and Percussive tempo-synced Loops. Melodic and Percussive Arppegigated/Arpeggiated/Gated Instruments. Percussive Impacts, Big Hit Ensembles, and Kits. Swipes, Scrapes, and Reverse Transitional Effects. Multis with up to 6 customizable Multi Script Macros (playable interactive preset templates made from multiple instruments). Bonus multis created by award-winning composer Bill Brown. Kontakt 5 Player – 5.0.3 or higher (free download) or retail version of Kontakt 5.0.3 or higher (sold separately). Mac OS X: Mac OS X 10.6 or 10.7 (latest update), Intel Core Duo (will not work in OS 10.5 or lower), 2 GB RAM. Windows PC: Windows 7 (latest Service Pack, 32/64 Bit) Intel Core Duo or AMD Athlon 64 X2, 2GB RAM. 1 GB free disk space for Kontakt 5 Player. 17 GB free disk space for sample content. 17+ GB library (direct download only). Stand-alone, VST, AU, DXi, RTAS (Pro Tools 9 or higher), ASIO, CoreAudio, WASAPI. Cinematic Guitars 2 MSRP is $399.99 and it will be released as a Direct Download on October 1, 2012. Propellerhead Figure v1.2 Figure, Propellerhead’s music app for iPhone and iPod touch, now supports AudioCopy and WIST. Motu Track16 Review Track16 is the latest addition to Motu's range of audio interfaces. The numerous features announced by the manufacturer are very appealing. Let's see how they translate in the real world! MeldaProduction MStereoGenerator MeldaProduction has announced the release of MStereoGenerator, an artificial stereo image generator.